﻿ Company | THAISENG TRADING CO., LTD.
Production of cast iron and cast steel. Sales of cutting tools,abrasive tools and measuring equipment. Providing solutions through service, such as re-sharpening and re-coating. Production and sales of metal working fluid. Started Import-export business at Higashi Sumiyoshi-Ku,Osaka,Japan. Opened Jakarta Representative Office in Indonesia. 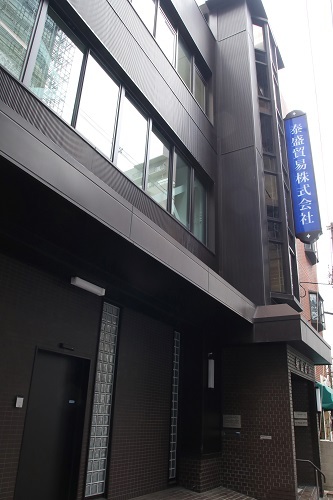 Relocated headquarters to Tennoji-Ku,Osaka of present address. Established INTERNATIONAL IRON WORKS CO.,LTD. in Thailand. Started production of Cast Iron and Cast Steel. Opened Ho Chi Minh City Representative Office in Vietnam. Established THE BURAPA STEEL CO.,LTD. Opened Phnom Penh Representative Office in Cambodia. Established PT. AZ TECS INDONESIA in Indonesia. Established Cong Ty TNHH Makita Vietnam in Vietnam. Established THAI SENG TRADING(THAILAND)CO.,LTD. in Thailand. Established CONG TY TNHH THAI SENG VIETNAM in Vietnam. Opened Delhi Liaison Office in India. Relocated new office and opened distribution center of THAI SENG TRADING(THAILAND)CO.,LTD. Opened Chiang Mai branch Office of THAI SENG TRADING(THAILAND)CO.,LTD. Established PT.EVER CHEMICAL INDONESIA in Indonesia. Opened Pune Liaison Office in India. Opened Rayong branch Office of THAI SENG TRADING(THAILAND)CO.,LTD.